The 3 megawatt energy storage system in Johan Cruijff ArenA is now live! Amsterdam, 29 June 2018 – Today the largest European energy storage system using second-life and new electric vehicle batteries in a commercial building was made live. Amsterdam Alderman Udo Kock, deputy mayor for Finance and Economic Affairs (Amsterdam) conducted the official opening ceremony. The 3 megawatt storage system provides a more reliable and efficient energy supply and usage for the stadium, its visitors, neighbors and the Dutch energy grid. Combining Eaton power conversion units and the equivalent of 148 Nissan LEAF batteries, the energy storage system not only enables a more sustainable energy system, it also creates a circular economy for electric vehicle batteries. 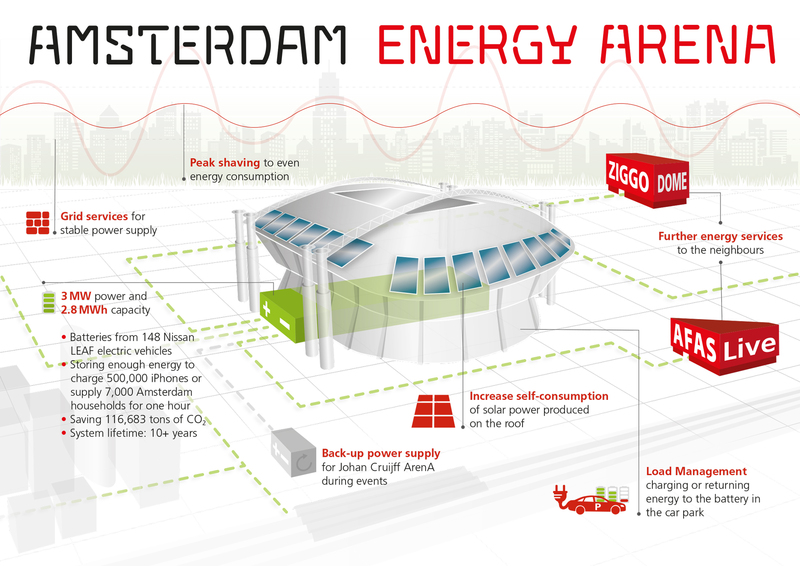 The energy storage system plays an important role in balancing supply and demand of energy in the Johan Cruijff ArenA. The storage system has a total capacity of 3 megawatt, enough to power several thousand households. This capacity also means that the energy produced by the 4,200 solar panels on the roof of the ArenA can also be stored and used optimally. The energy storage system will provide back-up power, reducing the use of diesel generators, and provide relief to the energy grid by flattening the peaks that occur during concerts. Johan Cruijff ArenA is an important player in the top league of international, multi-purpose stadiums. It is the home of AFC Ajax and the stage for the Dutch national team, big concerts, dance events and business meetings. Johan Cruijff ArenA welcomes more than two million visitors annually. Johan Cruijff ArenA makes it all about the audience experience. Together with its partners, Johan Cruijff ArenA offers top-level services and facilities, and is constantly working on creating an optimal fan experience in and around the stadium. The stadium’s new energy storage system and related company, Amsterdam Energy ArenA BV, are concrete results of the innovation program managed by Amsterdam Innovation Arena, in which knowledge institutions, governments and companies such as BAM, Nissan, Eaton and The Mobility House are working on the stadium of the future. The stadium and neighboring area function as a Living Lab; a hotspot for testing innovations in practice. Innovative concepts and ideas as well as proven solutions in the field of stadium construction, management and exploitation will find their way to stadiums, sports and recreational areas throughout the world via Johan Cruijff ArenA International. The partners in Amsterdam Innovation Arena are: Johan Cruijff ArenA, Amsterdam City Council, Amsterdam Smart City, TNO, KPN, KPMG, Huawei, Microsoft, Signify, Nissan, Eaton, Honeywell and BAM.